Dancing on the Light is an ethereal abstract landscape oil painting 80x80cm on a deep 4cm box canvas. 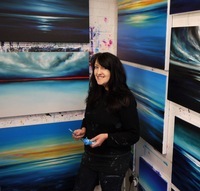 It’s inspired by the light on the River Thames outside my studio. The paint is layered and blended and the title is from a Neil Young song. The sides of the artwork are painted white, and it is ready to hang. When I despatch a painting I always send a personalised card and a complimentary set of 3 hand made greetings cards as a thank you. I can also personally deliver the painting at a pre arranged time that suits if you live within 50 miles of London.